While this is not technically Billy Joel's sophomore album, if you don't count Cold Spring Harbor (and I don't), then this is his second record. If nothing else it's his second major label release, and the one with which he had to attempt to follow up the success of Piano Man. Like any good artist, he was embittered by his fame and chose to test his new audience a bit. This album's not off-the-wall weird by any means, but putting two instrumentals on the record (especially when one of them is the baffling "Root Beer Rag") is a gutsy move. "The Entertainer" lets us know exactly where Joel stands, with lyrics that don't even attempt to hide his anger at the music game. I love a good fed-up ballad, and this is a great one. "Roberta" is a great song, a steady pop number that plays it straight and totally works. "Last of the Big Time Spenders" sounds like a song that was left off Piano Man, but the arrangement is much more filled out than anything on that record. "Weekend Song" is a weird working man's anthem that seems both completely fitting and completely uncharacteristic of Billy Joel. 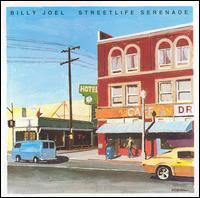 "Souvenir" is a fantastic two-minute ballad that's just Billy and his piano, and it's solid. The best track here might be the opener. "Streetlife Serenader" rides a dark melody that is both angry and delicate, and then gets heavier when it needs to. A great song, and again, a glimpse of what Billy's building towards. Not his strongest record overall, but a solid one. It's always great to hear Billy Joel when he's a bit miffed.